One man’s harrowing journey through a personalized hell has been the focus of each of Steve McQueen’s three features, but never has the metaphor been so effectively explored by the filmmaker as it is in his deeply moving fact-based drama 12 Years a Slave. McQueen’s penchant for precisely pointed perspective is applied again here, but his often clinical approach has been replaced by a solid mix of old-fashioned emotional extraction and poignantly executed artful reflection. This marriage of styles makes for a very different kind of McQueen movie, one that takes his previously exhibited strengths and builds upon them with a dramatic sensitivity that is distinctly human. 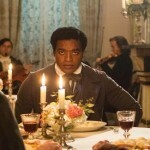 The story of Solomon Northup (Chiwetel Ejiofor), whose autobiography is the movie’s source material, tells of a dozen terrible years wrought from deception and devastation. A free black man in 1840’s Saratoga, New York, Solomon is befriended by a pair of gentlemen who quickly turn around and sell him into slavery, a fate that consumes him quickly when he is unable to immediately produce any proof of his freedom. From the moment that Solomon’s world changes, McQueen immerses us in the senseless brutality that defines a slave’s existence. Solomon is beaten merely for refusing to acknowledge his new status and this act of violence is captured in one long take, the camera set low so that Solomon’s hunched body fills the frame. By forcing this act to unfold in real time, with a stationary camera to further align our experience with Solomon’s, McQueen ensures there is no escape. From that point on, we are almost entirely anchored to Solomon’s perspective and our only break from the horrors he experiences is the opportunity to briefly glimpse inside his head as strands of the narrative web manifest themselves in the form of flashback-assisted memories. These breaks are brief and infrequent, leaving us to watch as Solomon adapts to his new life. Ups and downs abound, but the ceiling for those ups is considerably low, so even at his highest point, Solomon is always forced to shoulder the weight of a wrongly burdened existence. He finds a relatively kind master in plantation owner Ford (a stiffly benevolent Benedict Cumberbatch) and adopts a tough, dedicated work ethic. But Solomon’s journey is one of constant change and discomfort, so before long, he ends up in the diseased care of Epps (McQueen muse Michael Fassbender), a sadistic monster obsessed with his slave Patsey (an absolutely heartbreaking Lupita Nyong’o), much to the chagrin of his wildly jealous wife (Sarah Paulson). We enter this new world of filth and frustration at the same time that Solomon does, so his eyes are almost always our own. Only one dreadfully disgusting scene between Epps and Patsey appears to break from Solomon’s gaze and the result risks dipping into gratuitous territory. Beyond that, we see and hear with Solomon’s eyes and ears, a move that etches the dangers of the Epps household rather sinisterly in our brains. It’s a madhouse of anger and pain and hatred and we’re only privy to the outbursts that Solomon witnesses regularly. Epps remains an enigma, which only increases his violent unpredictability. Fassbender imbues the character with a vicious energy that shows him seething at all times, either in moments of explosive fury or during shots of quiet, predatory glances. His blood is always boiling and that sly charm that Fassbender usually exudes has turned toxic here. Any sense of security that Solomon had at the previous plantation is swallowed up by the mere presence of Epps. As time slips by in months and years that McQueen wisely melds together without warning, the experience and journey only grows more emotionally exhausting and horribly upsetting. We witness many tragedies from Solomon’s perspective, events that are all the more challenging because we know we can’t see them through to the end. A slave sold with Solomon at one point loses her children in the sale and her heartache extends through a chunk of the movie, before ending abruptly when she and Solomon part ways. The lack of resolution for these peripheral characters hints at all the other stories that come and go without tidy conclusions. The window of perspective is tight and closed, leaving only fleeting glimpses of others that pass by the frame. 12 Years a Slave is Solomon’s story, of course, and maintaining that focus is what allows McQueen to slowly, carefully increase his picture’s emotional impact. This journey’s power is a cumulative effort, the final sum of which can’t be entirely anticipated until it arrives. Ejiofor’s quiet, nuanced performance is tremendous throughout, but as Solomon nears the end of his onscreen experience, Ejiofor compiles everything he’s brought forth until that point and packs it into an extended punch that is felt long after the credits roll. One shot in particular has Ejiofer held tight in an otherwise open frame, the rest released to nature as Solomon looks out and ponders the possibility of freedom after all these years. The shot features no dialogue and is soaked in subtlety, allowing us to reflect with Solomon on this journey and to be held breathlessly in awe of Ejiofor’s vulnerable poise. McQueen often favors these close-ups that capture the character’s captivity with cramped compositions, while giving them some hope by aligning them on one side and leaving open space that suggests there’s still room in this journey to move on. These, along with the long takes of torture, are among the movie’s most emotionally immersive elements. Other shots, like a dropped bar of soap that euphemistically concludes a whipping or a close-up of a single tear sliding down a cheek, flirt too closely with treacly territory to make a strong impression. But these issues prove minor in the face of all that McQueen and his cast accomplish. 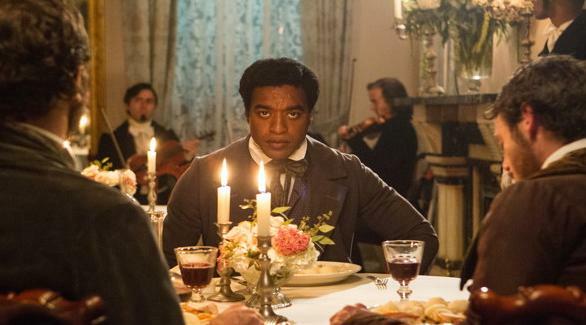 Other than some ill-executed supporting turns by Paul Dano and Brad Pitt, the cast is stunning and Ejiofor brings an overwhelmingly touching determination to his role. This journey to hell and back walks an unforgettable path and McQueen ensures that the camera lingers on the horror of a world that’s lost its humanity and the beauty of spirit and nature that still exists in spite of such ugliness. Shots of the bayou with its drooping trees and many angled images of the sky above provide us with our own sense of visual freedom that connects us to Solomon’s experiences. 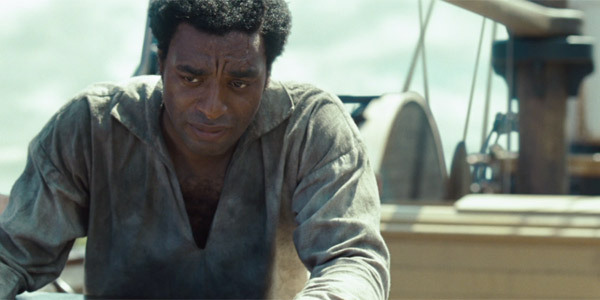 A score by Hans Zimmer, in which he often repurposes portions of his “Inception” music, may sound familiar, but it fully fits the dramatic identity of 12 Years a Slave. Through a visual and aural invitation, we become participants in the drama here, which allows our emotional response to run parallel with Solomon’s. We feel his pain, fear for his survival, and rejoice in his triumphs. We’re trapped in the frame with him, but we trudge forward, side by side, ever in search of cinematic freedom. Roots of the 21st century. Powerful film. Everyone who can should see it. It is a hard watch but one that makes you a better person for having sat through. 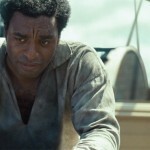 Chiwetel Ejiofor is spectacular. Give the man his Academy Award now. That is going to Redford for All is Lost. I would be happy with either, really. They’re both astonishing performances, very different and unique in a lot of ways, but also connected in their incredible use of silence and reliance on facial expressions. 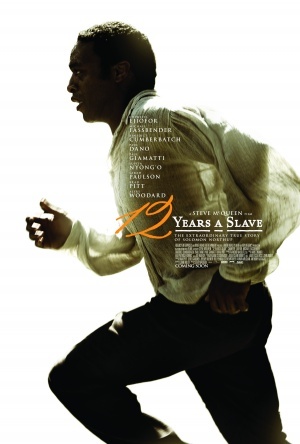 I think 12 Years a Slave is going to do very well with the Academy, so this race is getting tight.